BOLT browser, which was till now in private beta testing on the Android platform has now dropped the beta tag and is available for download to all Android users. BOLT 3.0 continues to offer increased speed and its famous social networking integration. BOLT is known for its unique ability to play and stream videos even if a handset doesn’t have Flash support. The browser’s “Social Tab” feature lets BOLT users connect to Facebook, Twitter, Wikipedia and data can be shared from the BOLT interface directly with the social network. BOLT also supports RSS Feeds, Facebook apps and games, Copy-paste feature, desktop like browsing and much more. 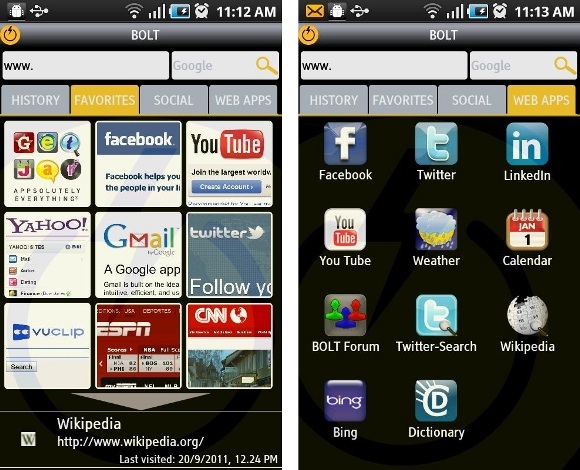 You can download the BOLT browser for your Android device over here.